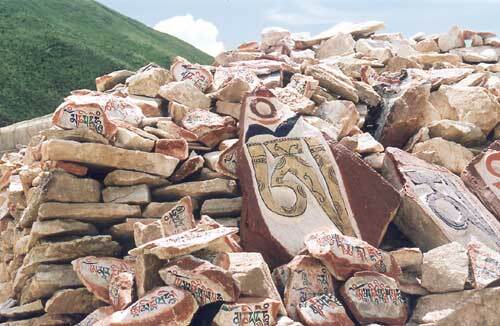 The Mani Stones at Simdzi is one of the first Heritage Projects undertaken by Rokpa to protect sites of special cultural and spiritual significance. 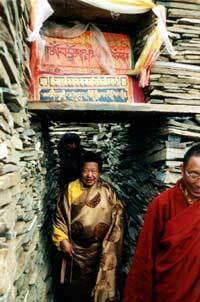 The wall was originally built by the great 19th century Tibetan Master, Patrul Rinpoche who is revered by all schools of Tibetan Buddhism. 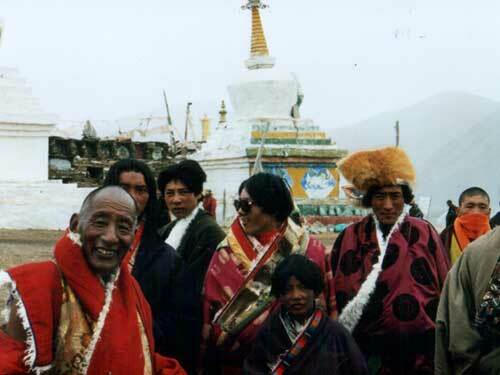 It was at this place that Patrul Rinpoche had a vision of Chenrezig stamping out the flames of hatred all over the world and transforming fields destroyed by war into fields of flowers. 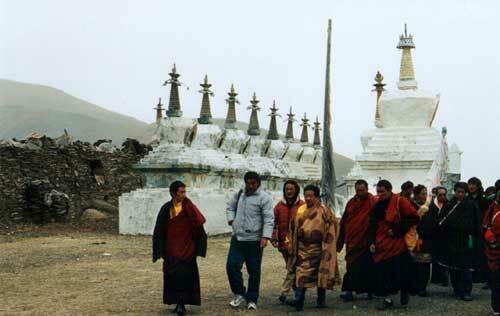 During the Cultural Revolution the wall was destroyed and Rokpa is now helping to facititate its repair. 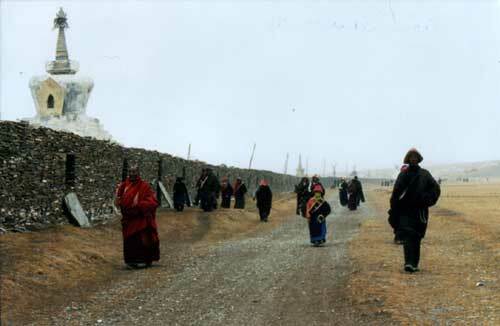 In 2005 Rokpa was asked to sponsor another 24 metres of the wall 6 metres wide and 5 metres high. 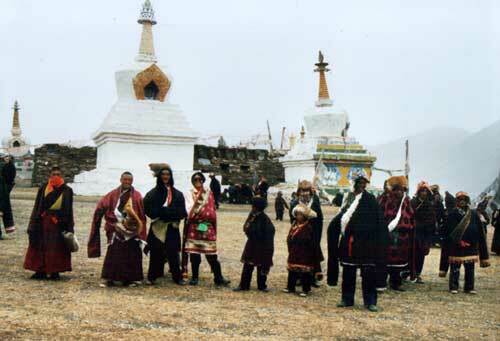 The carving of the Kangyur which consists of 103 volumes of the Buddha's teachings accompanied by three images at the beginning and three at the end will then be completed. The images have to be made in Chengdu since there is not an artist on site who can design and engrave the images accurately enough. The person who originally undertook to restore the wall is very ill and wishes to see the work completed before he dies. 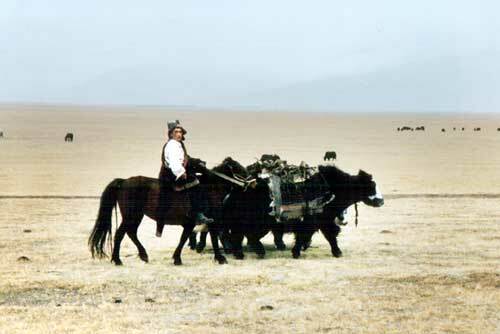 Rokpa International wants to make a special effort to fulfill his wish. 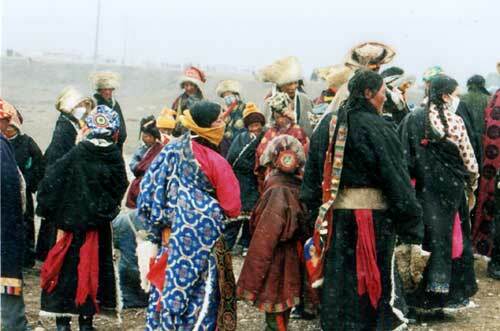 It will take another three years to complete the carving of the text and the images. 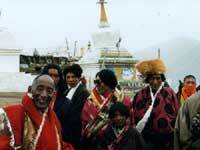 When Akong Rinpoche visited the wall in 2004 with a multi-national party of Rokpa supporters there were more than ten thousand pilgrims gathered in tents at the east side of the wall who in five days completed a hundred million Manis for world peace. 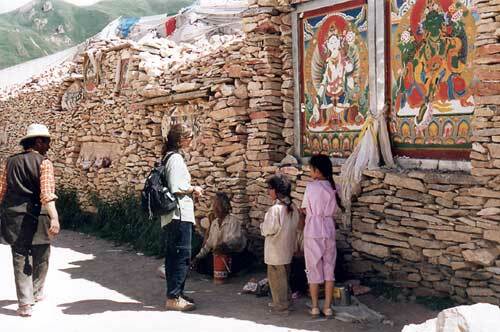 Many also made circumambulations around the wall while praying and reciting mantras. A pligrim who is prostrates his way along the Mani Wall. 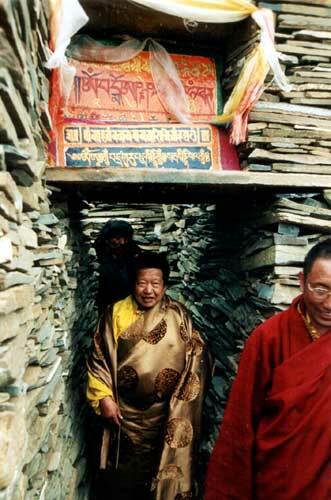 Akong Tulku Rinpoche walks through one of the small shrines set within the wall and at each end.